From Lake Windermere, the longest lake in England, to the small Rydal Water, the Lake District is simply sensational. Explore its many hills and valleys and perhaps view some wildlife too. 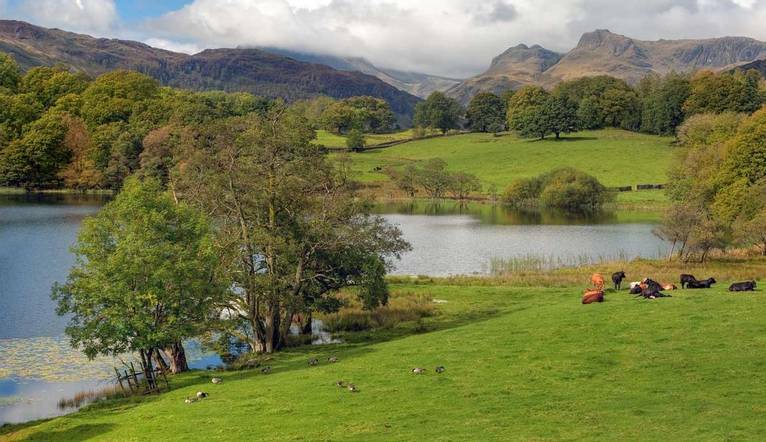 With our base for the weekend on the banks of the River Kent in the famous market town of Kendal, our walk on Saturday takes us over to the small and quaint village of Rydal. From here we strike out on a circular walk following the coffin route to Grasmere. It was called this as it used to take the coffins of the dead from Rydal to the church burial in Grasmere. Our path then heads across to the valley of Little Langdale for lunch at the Elterwater Inn (own cost). This afternoon we take a gentle riverside walk down the River Brathay to Skelwith Bridge before heading up to beautiful Loughrigg Tarn and back to Rydal. Our half day on Sunday takes us into the charming Edwardian seaside resort of Grange Over Sands. We walk through woods to the summit of Hampsfell to enjoy stunning views over Morecambe Bay and the Lake District Fells. We then descend following in the footsteps of monks to the village of Cartmel with its charming selection of shops and 12th century medieval Priory church. A nice weekend with a friendly and good sized group. The walks were easy to medium in grade and very enjoyable. Being from London, it was lovely to see a bit of the Lake District! The hotel was lovely, clean and comfortable - exactly what I expected! The Solos Tour Leader and the guide for the walks were superb - their knowledge was amazing! This converted 18th century tanner with its beautiful location right on the banks of the River Kent proudly offers a Bar & Bistro, Riverview Restaurant serving locally grown fresh produce. The hotel can be found off Junction 36 of the M6. Kendal station is 250 yards away. Complimentary car parking is available. Leisure Club with indoor swimming pool, sauna, gym, steam room, gym and hot tub. The spacious bedrooms feature flat screen TV, hospitality tray, safe, iron, hairdryer and complimentary Wi-Fi. Two guided walks are included in the programme. The walking programme is graded easy to medium and you can expect to walk up to 14km (8 miles) on the first walk and around 5km (3 miles) on the second walk. A coach will be used to transfer you to the starting point of the included walks. There is often confusion on the question of gratuities, since it frequently depends on the type of holiday, location and, of course, your attitude towards tipping, as to what is normally expected. In order to give you a rough idea, we have given appropriate guidance below. The Tour Leader will be on hand to offer advice or suggestions if required but gratuities are offered entirely at the sole discretion of the individual. We suggest a group collection at the beginning of your holiday to cover drivers, guides, porters and hotel staff (including restaurant, kitchen and reception staff) of approximately £5. Your Tour Leader will collect this on your behalf and distribute it accordingly, thus relieving you of the burden of who, when and how much to tip. The tipping of bar staff and housekeeping will be left to your individual discretion (the rounding up of the drinks bill and a small amount left in your room on departure should cover this and would be much appreciated). For any meals that are not included in your itinerary, restaurants expect a 10Ͽratuity (do check that service has not already been added to your bill). For taxis 10Ͽf the metered fare.